Big sister Clover in ALP inspired conflict of legal duties in Barangaroo controversy? SAM's editor in a previous life campaigned hard for Clover Moore as Mayor of Sydney City Council first election with active envelope stuffing and poster runs deep into ALP turf. And we did gladly second election, more subtly, overlapping with the existence of SAM: By noting that ALP rival Burgmann was compromised by such as her own profile/tourism piece in New Matilda ezine by airbrushing the horror of North Korea's death camps; and also a tricky co-author colleague avoiding public hiring protocols at Addison Rd Community Centre. All matters of fair comment, and viral emails. The ALP got only one seat at the second outing against the Clover locomotive (partly due to ICAC Wollongong scandal too). Clover is criticised by some as a career opportunist, says rival Cr Chris Harris of the Greens in a telephone conversation with SAM. Yet SAM's view like the owner editor of the City Hub, Lawrence Gibbons, has been: 'half of Clover as state MP doubling as mayor, is worth a whole Michael Lee' (referring to her ALP rival first election, former federal minister). Clover has credit as a community independent. Indeed in the first election Larry Galbraith as organiser for Clover had us dressed up on town hall steps for the ABC tv camera as former Sydney City ALP Mayor Pat Hills MP of post war boom era as a precedent. My membership on the Board was designed by the ALP to shut The Greens and the community voice down or at least quarrantine it. I was having none of that. In 1996 we were both a director of the Incinerator and sending a media release to chief of the Environment Protection Authority Neil Shepherd to close the polluting monster down just as council leadership were meeting the EPA boss. I rang the secretay to Shepherd so she would take the presser into the meeting! This brought howls of outrage from the ALP leadership at council. Threats to report us to the Dept of Local Govt to show cause why we should not be dismissed for breach of director and or councillor duties to the WWPP Inc. (Keeing in mind Cr Plummer ALP was employed by same LG Dept, working for LG Minister Ernie Page MP for Coogee which itself overlaps with Waverley council area). In short a choreographed stitch up led by Incinerator supporter ALP Mayor Barbara Armitage. My quasi legal political response was to rapidly research the Local Government Act 1993 objectives and duties of councillors (in the offices of the Environmental Defenders Office actually). These statutary obligations include communicating with the ratepayers, informing the public, and leadership. These are balanced against other concerns like act in best interests of the council which is a subjective beast. What is the role of a councillor? [section] 232 What is the role of a councillor? • to facilitate communication between the community and the council. The incinerator union delegate even came to our workplace at Friends of the Earth Sydney in high emotion that the workers were being shafted by "a mole". He was invited in and we talked about the open campaign against the facility, agreeing to disagree, and he talked about the work processing often disgusting waste of the Eastern Suburbs. He left unhappy but alot less angry. Perhaps he could see the writing on the wall and that we also were human beings. Cr Norman Lee as an ex ALP indepedent was quite acidic at the special meeting early 1997 where this writer was meant to be the main course, roasted. He soon realised I was going to buck their interpretation of the legal obligations by relying on the LG Act provisions above as a community independent councillor. Even if it was arguable as a conflict of laws situation, it was sufficient political cover and they dropped their proposed reference to the Local Govt Dept. (As a footnote, we faced all this alone, with the Green Party local branch including such as Lee Rhiannon, Jeff Ash, councillors still to be elected all no where to be seen busy no doubt busy elsewhere.) The incinerator was closed by State Govt decision later in 1997. Which brings us back to Clover on the Barangaroo 'Delivery' Authority, bound by confidentiality. As a community media person and high consumer of mass media we did note this last few months the apparent silence of the City Council leadership as the developers and govt, effectively represented by (self interested?) Paul Keating, were all over the Herald and the ABC radio. Silence of the Mayor as consent?? That was the unresolved question in our mind, and presumably in most of the general public's too. Obviously this concern has boiled over in the press today. Now Clover says this morning on ABC radio she has been fighting the good fights behind the scenes and "reasonable people" will understand this. The jury is still out on how true that is. Cr Mallard (Lib) was impacting in his critique on abc radio that councillors in the broad have been kept in the dark by Mayor Clover over an historic upscale $5B redevelopment. 1. the light rail concession is not really integrated into city transport being more of a tourist detour Central to Circular Quay possibly along Sussex st. 'That's not integration' presumably referring to the junked metro. 2. the tri-generation sustainable power plan for the buildings are now virtually standard practice e.g. condition of consent on the CUB site due to Cr Harris and Michael Mobbs litigation, as well as in place for SHFA building at Workplace Six, so this is not a Mayoral achievement as such. Now Clover similarly might wish to reconsider her duties under the Local Governmnent Act and whether that provides sufficient legal and or political cover to go much much harder on the Barangaroo developers, and in a much much more public way. And the question of silence in the past remains to be resolved. No doubt Mayor of Sydney CBD is a tough gig, as always. At a ...... last January a Po-lice there got talking in a late night reverie about who he has booked from our class. He said there is an unwritten rule that police generally will not book nurses for driving offences - presumably speeding or similar. He said it's because at times of major injury (of police? the public? victims of crime?) nurses are the guardian angels and get major sympathy from the police. That might be a critical factor for whether dangerous driving from fatigue or whatever might not get proper police attention?? There isn't time or space here to write about all the SAM editor's experiences in the Northern Territory as a legal adviser and paralegal over 3 intense weeks at variously Jabiru, Jabiluka protest camp and Darwin. From waking up on a bullant nest, willy willy through the kitchen tent, meeting the cream of idealistic Australian youth, hearing Jeff Buckley for the first time over the radio sadly drowned the day before. We slaved over a legal data base of 400 arrestees or so in the Environment Centre of Northern Territory in Darwin before flying back to duties as a single Green Party councillor at Waverley Council in Sydney. All in the suffocating real politik of the Country Party conservative NT govt. The Waverley ALP Mayor Paul Pearce, now MP, commended our hard work in open council as "brave" and for that we were gratified. Other kudos came from middle class activists rotting in a Jabiru gaol cell who "loved" the work we did, providing a shield against the harshness of the legal system there until NT Legal Aid got their act together. (McLoughlin is gaelic for shield apparently.) And there were further loose ends back in Sydney due to a s*xual assault complaint by a protester (at the lower end of the scale) against an unidentified security officer (police or mine staff was never resolved). Now as we hear in 2010 about a controversial uranium dump at Muckaty Station in the NT, and U mine proposed near Alice Springs, and 4th U mine at Honeymoon in South Australia, we think this document is of public interest, as well as nostalgia value. We have redacted (in the legal jargon) the identifying surnames except for the most public of figures like former MP Jo Vallentine. Suffice to say many of these folks are now serious professionals in Australian society and no doubt hold similar beliefs today and God bless them for that. Now this reader needs more of that goodwill too as we contemplate re-commencing a legal career after an at times bruising phase in the green ngo sector under the heel of a cunning and often cruel, dishonest ALP Govt in place for 15 years in NSW. We received a copy of this recently, which apparently ran on the Sydney Daily Telegraph website late afternoon last Tuesday 9th Feb. It may have run in print the next day but we didn't see it. We first became aware of her through a reference from the Intellectual Disability Rights Service (refer penultimate story) who were most impressed with her competence and honesty. Picture: Carol and friends have lunch at Wesley Mission in Pitt Street Sydney. Photo by Tom McLoughlin. By all normal expectations Carol should be dead, according to her own prediction. "When daddy dies I won't be here anymore". This was the grim conversation we had with special needs greenie volunteer and art lover Carol 4 years ago. It still chokes us up to think about it. A chronic generally harmless schizophrenic, she still manages to live independently, with an enormous survival instinct that honours both her deceased parents, survivors of the Holocaust. "No. Carol, listen to me. Your life belongs to you. No one else. You have your own life after your dad dies." Seems no one ever told Carol this before explicitly or implicitly. Seems that's all 'the permission' Carol needed too. In an early legal skirmish driving to the Guardianship Tribunal another moving conversation "Carol do you trust me?" "Yes". So that's what that oath back in 1990 being admitted as a solicitor in NSW was all about: An officer of the court albeit a shadow of 'The Street Lawyer' as author John Grisham describes them (a talking book on recent drive to Canberra). After chucking the suburban lawyer (our erstwhile principal) option we conferred with the good people at Intellectual Disability Rights Service. Who is "honest and competent" in this area? First referral was to barrister Tania Evers who sees us gratis in Martin Place office but she is overloaded. Next stop is Pam Suttor a member of the Law Society Council, currently convalescing from a serious back problem. When we met Pam first she was in the main office at $450 an hour presiding over the boutique firm in York St like a cross between the Face of Boe and Jabba the Hut - an eternity of experience. Much evidence and failed settlement conference later we came to the court hearing. This week Carol represented by solicitors L Rundle & Co, principal Pam Sutter, lawyers Chris Windeyer (yes that famous name), and team, with barrister silk Chris Simpson SC achieved a judgement from Justice Ward in the NSW Supreme Court in favour of Carol. Out of the 12 parties in the Family Provision Act litigation involving $800K in legal costs (for all parties) over a family estate of perhaps $8 to 16M in size, Carol had the strongest case with her special needs. L Rundle and barrister Simpson are yet to be paid anything for their 3 years of legal slog. They will be properly compensated out of the estate but they took the risk too for several years. I call that above and beyond the call of duty. Carol was awarded a judgement of around $1.26M yesterday 12 February 2010 and we were honoured to be her pro bono legal tutor/next friend in the legal process. She has always been 'our people' as a greenie even as a conservative reader of The Australian. In the course of the judgement hard nosed commercial legal veteran Justice Julie Ward, , said "..in Carol's case ... her normal life expectancy ... is around 41 years". Justice Ward then carved up both the legal arguments, evidence and estate of the parties according to their merit and needs and the legislation. In a 133 page double spaced judgement after a 4 day hearing mid December 2009. We guessed earlier this week in writing a $1.5M result for Carol, and perhaps the lower result down from $2M claimed resulted from a reduced "notional estate" around technicalities of survivorship/joint ownership of shares etc. A win for the wealthy step family. Even so there is provision for current and future aged care accomodation, supervision and medical costs all itemised at paragraph 371 of the judgement. We are very confident there will be no appeal. The fund will be securely managed by the Public Trustee. The law was moderating the cold dead hand still reaching out from the grave. Rest in peace daddy, the living will take it from here: Friends, legal respresentatives, public trustee, siblings, step brothers, other relatives .... and the law. Justice was done. One wonders if the misdirected defamation case allegedly a cynical SLAPP - strategic law suit against public participation - is also a cause for ethical complaints against lawyers for Gunns? Together with this settlement Gunns have paid defendants over $1.3 million in settlements and costs awards. At Gunns 2009 AGM it was revealed Gunns’ costs were $2.8million. Tort law aspect of googling around Rupert's Paywall? Rupert Murdoch has had a lot to say lately about the internet, and how a modern media mogul might milk it for corporate gain. Paywalls appear to be a key to the Sun King's strategic thinking, restrictions around content to squeeze micro-payments from an eager readership. We already have one right here at News Corp, Murdoch enthuses. "We have it already with the Wall Street Journal. We have a wall, but it's not right to the ceiling. You can get, usually, the first paragraph from any story -- but if you're not a paying subscriber to WSJ.com all you get is a paragraph and a subscription form." We hate to break this to you Rupert, but the WSJ doesn't so much have a paywall as a permeable membrane. You can read anything you like on the site, in full and for free. Go to the site's home page (here it is). Look for a story with one of the little key symbols next to the headlines. This denotes paywalled content. Click on that headline. When the locked story page opens, cut and paste the headline of the story, in full, into the search bar of Google. Google will pull that story up to the top of its search page. Click on that headline link and there, hey presto, is the story in full for free. We point this out just by way of showing what a tricky thing these internets can be. Sorry Rupe, but there it is. I'd be a little cautious about that google method of going around a paywall, or promoting same. Forewarned is fore armed. As true as it may be, it may be technically illegal to promote such a mechanism one day. Even if not currently, in the future. Consider the tort (like negligence law but not negligence) called tortious interference in contractual relations. The terms and requirements tick the box would create 'a contract' - this is a technical issue itself (what is the contract?- Perhaps this: News corp provides webpage access to news precis, viewer agrees to terms and conditions like to not google around paywall, promise each way, contract? I do think so as former novice commerical litigator). Now the viewer goes to news precis page, but now as a contractee not just a web surfer. Now if other people (like Crikey etc) encourage a breach of the paywall then you will be exposed to a legal claim of tortious interference in contractual relations. That is you will have interfered in performance of a legal contract by tempting people into illegal non compliance. It looks quite arguable to me anyway. The tort originally was designed to prevent meddlesome third parties from frustrating normal commercial relations between folks as a public value in the emergence of capitalist society, but surely applies in the web 2.0 world. And it probably matters not (?) if the interference is to the benefit of one or other party (by helping the viewer avoid the paywall fee). Sure enforcement will be a big issue. But then the law is catching up with hackers too. Prison even. Disclaimer: You will need to get your own legal advice. I don't have a principal solicitor in NSW only a restricted practising certificate and can't sell legal advice as a sole practitioner. Consider this an academic article. Our source advises that Senior Planner Sam Haddad has been associated with approving a controversial, environmentally destructive development in the past, well before the now famous Catherine Hill "land bribe" finding by Justice David Lloyd of the NSW Land & Environment Court (LEC) , or murder of Mr McGurk causing a parliamentary inquiry into planning issues. Indeed Judge Lloyd's name comes up again hold the line on good planning practise in 1998, as does Planning officer Sam Haddad and an allegation of "two green lights" being issued according to a sand miner applicant with his gun barrister to load on the pressure. Read on. This was during what became known locally as The Sand Wars between various miners and local community groups reminiscent of a Mad Max script. 57. I have come to the view that the applicants should not receive the benefit of the Court's discretion for the following principal reasons. "The courts have, under the various planning regimes, emphasised the significance of compliance with planning requirements and the danger of allowing individual hardship in particular cases to erode the general operation of planning schemes. These considerations are no less relevant at the present time." * whilst there may be some financial penalty as a consequence of the respondents' activities being restrained, I note that there is evidence that the subject land is not the only source of income of the first respondent. It has other sand mining activities elsewhere, which will continue to provide it with income. I also note that the agreement between the first respondent and the land owners (the second and third respondents) may be terminated by them if sand extraction is no longer possible. If as a consequence of the Court's orders in this case the agreement is terminated, then the land owners would, it seems, be free to enter into another agreement with some other operator. 1. The first and second respondents, their respective servants and agents abstain from using, permitting to be used or causing to be used the land being lots 196 and 29 in Deposited Plan 752025 within the Parish of Cornelia and County of Cumberland and being contained in Folio Identifiers respectively 196/752025 and 29/752025 situate on Old Northern Road at Maroota for the purposes of an extractive industry and sand mining (except for works of remediation or restoration) until such time as a development consent permitting any such use is granted. Meanwhile the dubious operations of PF Formations Pty Ltd, commercial rival of Dixons, in the same Maroota locality went on their merry way apparently with Council staff blessings. This perceived differential of local council treatment, as well as intrinsic impacts, was at the heart of the conflicts with the local council and the local objectors also. 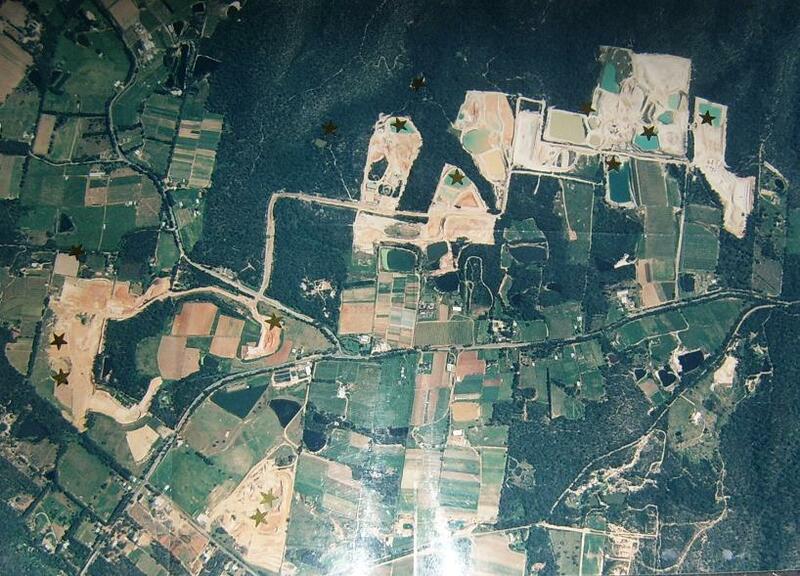 Picture: Dixon Sands operation in 2008 EIS for extension of their development approval area. What we find most fascinating is this scenario according to our source: Patriarch Ken Dixon, who is now an invalid, and his heir apparent, son David Dixon having been burned badly by Lloyd J, then organised a conference with non other than senior planning officer Sam Haddad, over a year later in 2000. Also was present was the barrister for Dixons by the name of "Phipps". Our source now thinks it was Jerrold "Cripps" but we don't know. There is no barrister currently called Phipps in NSW according to our search of the bar assocation here 9 years later. A barrister is obliged to accept clients according to the taxi rank rule and we can't say the miner or their lawyer did anything wrong pressing their case. What we worry about is the selective open door policy by the Dept of Planning or as Quentin Dempster calls it "influence peddling". But what has got us puzzled is what is meant by "two green lights" back in 2000, which then led to an amateurish, failed community legal challenge? Was that private meeting official planning process? Absent public submissions and application of planning rules according to merit? Was the meeting in 2000 transparent, recorded on file notes or not, as per scrutiny of more recent cafe meetings with Graeme Richardson for an unrelated development reported on NSW Stateline, as here in due course, last night 23 October 2009? All very interesting because we have heard allegations that another council Penrith, with a big sand mining sector was running a bribes book by one of the officers many years ago. Whether the book still exists we don't know. Swimming pool regulation in NSW: Nanny state or essential intervention? Well as Forest Gump might say, stupid is as stupid does/writes, eh Ms Devine? We have vague recollections of writing a legal briefing note on the original pool legislation in NSW in the early 1990ies. We suspect it may have been for the Environmental Defenders Office at the time, as we sniffed around which green group we might contribute the most. And then we saw this above last weekend, picture taken today - and yes that is a childrens play slide about 5 metres from an unfenced/broken fence pool, albeit raised off the ground. And yes that is the open driveway from the street at left foreground theoretically accessible to neighbourhood kids. We were hurried along by an occupier so we don't know if it was filled with water or not. Nor did we see any children nearby. A week earlier in another location we drove along a street in the Hawkesbury at 7 am on a Monday, street quite empty, and we noticed a 3 year old healthy happy child wandering the street alone complete with grubby barefeet and coloured pencils in one hand. Suffice to say with the help of a local taxi driver - including brief report via taxi radio to the local coppers - we encouraged this brave little adventurer who apparently woke up with the early sunlight to go home quick smart . An old lady sweeping her front told this writer she had noticed this wandering angel several times and that "It's dangerous". Get it? The reality of unsupervised kids and unfenced pools? If the pool legislation saves only one child from drowning - will it be worth it? Probably. We have been in correspondence with the NSW Dept of Environment, Climate Change and Water since a court decision in mid August 2009. The Land & Environment Court registry advises that their CD tape of the hearing is still unavailable despite a ordering same over a month ago. Something about a backlog. Here is the second part to troubling material which is a little complex but important because this guy will be giving evidence on mining cases in NSW in the future. All this and more will be shunted off to the NSW Attorney General later today, as suggested should happen by the senior solicitor for Hawkesbury City Council, one of the parties in the litigation. Our role was as pro bono legal agent for two objectors Diamond and Sneddon, backed morally by several peak and local environment groups. If we had the bucks we could have cross examined the 'single parties expert'. I refer to correspondence yesterday at point no. 2 re complex facts of failure of miner Birdon to effect deep burial of dangerous dredge fines (14-20m) to date, and maybe forever. Today we have clarified for ourselves the relevant diagrams in the 1996 consent/approved plans verifying where the obligation for deep burial (14-20metres) of dredge fines specifically arises. Given Birdon as below specifically claim they did 'complete stage 1' by 2002, and admit they have never buried at depth, they effectively admit their own breach. Picture B above: Point "F" of the rehab plan schedule at left to "shape ponds". What does this mean for stage 1? Refer next. Picture D above: Plan 3 of 3 shows the profile of a 'Clean Water Pond' at 14 to 20 metres depth (crown land from 15.26m). Picture E above - staggered approval in Part B condition of consent in 1996, effectively repealed from August 2009. Picture F above: Bruce for Birdon wrongly claims compliance with stage 1 of the development without any burial of dredge fines as required. We think our analysis above and Birdon's admission to the LEC they have never buried the dredge fines at depth 1996-2009, not only proves a non compliance with 1996 DA conditions all the way to 2009, but also risk of present or likely future breach of [Protection of the Environment Operations] Act: This is because of the likelihood of relatively shallow dredge fines leading to future collapsed dam walls and water pollution incident as per the 1989 $10K court penalty - the original motive for the deep burial given concerns of EPA and HNCMT etc in the mid 90ies. Regrettably we suspect the effect of the decision by the LEC's C'er Brown (still to see final conditions signed by LEC, available at counter at HCC, and not on web: pers comm 9 Sept 09) is to compress all 6 stages of the original approval into one continuous stage to 2021. Now we fear the promised safe burial of dredge fines at depth in a final water body now only requires compliance some time approaching the year 2021, and probably never: This timeline follows from a HCC legal document (we obtained off their planning file) re proposed draft consent conditions - deletion of conditions above namely 3 and part B of the 1996 approval, combined with proposed condition 35 granting 25 year period of approval starting from 1996 to 2021, or if 2m t volume exhausts first. That last tonne will never be mined. We understand some 350,000 tonnes of tailings remain at relatively shallow levels for what is proposed to be a 10 ha final lake water body. A regulatory debacle? We think so. But perhaps DECC or Dept of Mines can take a constructive role better than HCC in addressing Birdon's failure to bury at depth for the last 13 years and bring some discipline on Birdon for the future? Please feel free to respond by return email, or tel. 0410 558838.